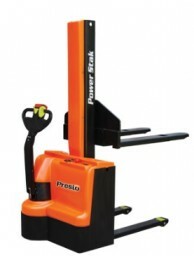 Presto PowerStak™ is a family of high performance, fully powered stackers that offer significant performance advantages over manual stackers without a significant price premium. An abundance of ergonomic features make PowerStak Stackers the safest, easiest to operate powered stackers available. Sleek, stylish design, low overall weight, and quiet operation allow them to fit nicely into a wide variety of work environments including: warehouses, loading docks, light assembly work cells, retail sales floors and more. Seven PowerStak models are available to satisfy any requirement including servicing racks up to 12 feet high. 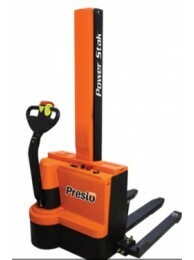 The Presto PPS2200-101AS PowerStak™ is a high performance, fully-powered stacker providing instant f.. The Presto PPS2200-62NAS PowerStak™ is a high performance, fully-powered stacker providing instant f.. The Presto PPS2200-62NFO-21 PowerStak™ is a high performance, fully-powered stacker providing instan.. The Presto PPS2200-62NFO-27 PowerStak™ is a high performance, fully-powered stacker providing instan..